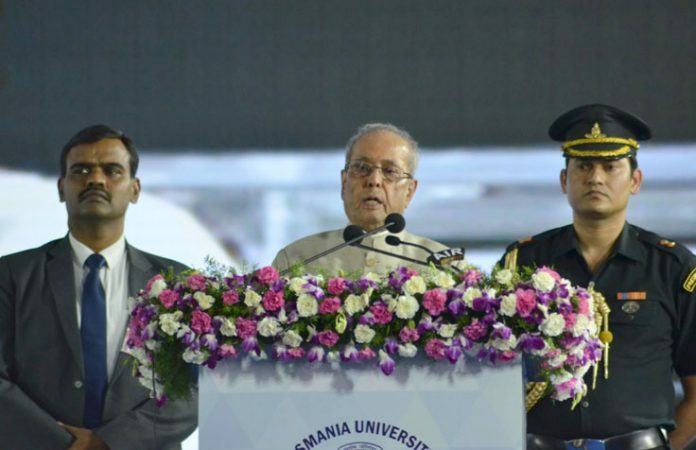 The President, Shri Pranab Mukherjee addressing the gathering at the inaugural function of the centenary celebrations of Osmania University, in Hyderabad on April 26, 2017. Hyderabad: The President of India, Shri Pranab Mukherjee addressed the inaugural function of centenary celebrations of Osmania University in Hyderabad today (April 26, 2017). Speaking on the occasion, the President said that we should develop Universities as temples of higher learning. They should be places for creating learning environment, where free exchange of ideas will take place and where mighty minds in the form of students and teachers would exchange ideas. Osmania University was also established with this dream that it will be an institution of excellence where free minds will meet freely, interact and exchange ideas and live in peaceful co-existence. In ancient India, India played a leading role in the field of higher learning. Universities such as Taxila, Nalanda, Vikramshila etc. had attracted mighty minds in the form of students and teachers. The President said that today, there is no doubt that there has been huge development of educational infrastructure in the field of higher learning. However, there are some areas of concern. As Visitor to more than 100 Central Institutions of higher learning, he had been continuously emphasizing that these Institutions in India should occupy their rightful place in the international ranking process. He said that apart from looking into this aspect, attention also needs to be laid on basic research and education. There should be interface and effective inter-linkages between industry and academia. We cannot live in isolation. There is need for investment in research and innovation so that we can occupy our rightful place in the international community. The President emphasized that these ideas must be translated into practical action.